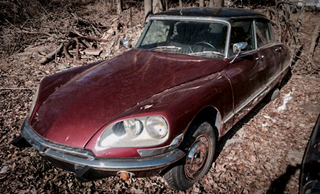 When is it justifiable to leave a rare French classic practically abandoned in the woods to rot? The answer is how dare you. This absolutely lovely 1968 Citroën DS is one of the most beautiful and comfortable cars ever built. Now it stands as a project that you can have, for less than a month's worth of work at minimum wage. Caution: I may be bidding. The 1968 Citroën DS is a rare sight, not only because they sold particularly badly in America in the late '60s and '70s, but because the car has features that cars today are only starting to receive. Its innovative hydropneumatic suspension system gave the car an insanely comfortable ride, unmatched by nearly anything today, while allowing for the ride height of the car to be changed instantly with the pull of a knob by the driver's seat. It was the only car that didn't require a jack to change a tire. It also had headlights that turned with the steering wheel, a first only emulated by high-end luxury cars today. Does not run. Has rare Cibie covered European lights and a wonderfully aromatic black leather interior that could be serviceable with a good cleaning. Was told the motor needed a piston sleeve when purchased and that the new harness might need some adaptation. Front windshield has a crack. Desirable '68 dashboard. A spare motor is available for rebuild in a separate listing. Body is rough but relatively straight with some filler work visibly deteriorating. Will need a paint job as well as a fair amount of mechanical work. A new wiring harness has been partially installed. This is not a beginner's project. This is a project after my own heart -a neglected rarity that only time, money, and elbow grease can fix. While some may see a rust bucket, the smart ones among us see a rare gem that should only be handled by those resourceful, daring, and somewhat silly enough to make their quirky French car dream a reality. I will be watching this auction closely. I suggest you all do the same. What Would You Do With This Crazy Cheap Porsche 911 Targa Project?